« The Largest Sudoku Ever! I’ve been asked a few times to post some Samurai sudoku solving tips. Well – there aren’t any special tips that apply exclusively to Samurai. Standard Sudoku rules apply, but to make things clear for newcomers, I’d like to give a brief set of instructions. 1. Each Samurai Sudoku puzzle consists of 5 overlapping classic 9×9 Sudoku sub-puzzles. 2. Each 9×9 sub-puzzle must be solved according to the rules of Sudoku: each row, column and 3×3 box must contain all digits from 1 to 9; therefore, digits cannot be repeated. 3. Each Samurai Sudoku puzzle has one solution only. Warnings: 1. DO NOT ATTEMPT to completely solve each sub-puzzle as an individual puzzle! 2. Each 9×9 sub-puzzle when solved individually could have more than one solution. 3. Never resort to guessing my puzzles can be solved using deduction logic. 1. Work on the puzzle as a whole. 2. Start with one sub-puzzle and solve as many cells as you can, until you can’t go further (do not guess!) 3. Move on to the next sub-puzzle. Use clues from the previous sub-puzzle. 4. Repeat step 2 for that sub-puzzle. 5. Keep repeating steps 2-3-4 until you solve the whole puzzle! 6. Do not start with the center sub-puzzle. They usually have fewer clues than other sub-puzzles. Usual classic Sudoku techniques are required to solve these puzzles: naked and hidden singles, naked and hidden subsets (pairs, triplets etc) and “row/column and box interactions”. For the hardest of puzzles X-Wing and Swordfish techniques might be needed. This entry was posted in Samurai sudoku, Solving tips and tagged Classic Sudoku, HARD, hidden subsets, instructions, interactions, IQ, rules, samurai, Samurai Sudoku, solving tip, solving tips, standard sudoku, SUBSETS, suggestions, swordfish, technique, x-wing. Bookmark the permalink. Post a comment or leave a trackback: Trackback URL. For newcomers — what are naked and hidden singles, naked and hidden subsets, etc, as mentioned above? Or where can I find out where they are — your help only tells you how to solve sudoku x puzzles, not regular ones (or samarai). I’m gonna work out this Sunday’s solution. I love a logical challenge on paper. I have been looking for about an hour now and can not find the solution to the 4-14-2006 Express Lookout Weekend Samurai Sudoku puzzle. My friend has 3 of the 5 puzzles done and has an error. I was going to help her find it. Can you tell me where the solution is located. Thanks! Terry, I’m sorry but we only post solutions for the puzzles printed in The Post. We don’t post those from The Express. That’s the deal we made. I lost my solution to the online samuri game from April 25. Is it possible for me to get the solution again? My brother Mom and i have just started these puzzles and are going crazy to try and finish them. they are so addicting and fun!!!!!!!! I would like to get a blank copy of the puzzle that is posted in the sunday post. Download it, print it and copy the given numbers from the puzzle that you have. Hello. I am solving this Sunday’s (12/17) Samurai Sudoku puzzle in The Washington Post and i was wondering, is it possible to solve it without using the X-Wing or Swordfish Techniques? (it says its a 2 out of 5). Also is whats printed the post Samurai Sudoku X or Killer? And what exactly is the difference between the the three versions? I would still like an answer to my first question. Also at the top you said “Well – there arenâ€™t any special tips that apply exclusively to Samurai.” well i believe i have found one that does. Well it would work for any large puzzle that overlaps in at least one nonet. It has to do with how numbers repeat because of the overlap. I can explain in detail if you want. Yes, 12/17 Samurai puzzle from The Post can be solved without X-Wing and/or Swordfish. It requires either naked/hidden subsets OR row/column and nonet interactions. There are a couple of approaches to solving it. In fact, about one half of the puzzle can be solved using only naked/hidden singles. – Samurai Sudoku puzzles are those that you can see in The Post every Sunday. – Samurai X puzzles are similar but with one additional rule: each diagonal (there are 10 diagonals in each Samurai puzzle) must contain all numbers from 1-9, just as any row/column/nonet. I was out of town on June 17, 2007. Unfortunately, the answer is no. The deal with The Washington Post is to show only solutions for the puzzles and not the puzzles themselves. This is simply because those puzzles have been designed exclusively for the readers of The Post and if I showed them on my site they would be available to anyone. I hope you find some other puzzle on my site that you find interesting. Hi, i’m a newcomer to this website but not to sudoku…..but i just started working on samurai sudoku puzzles…..and from what i seen so far from this website, i see there are a lot of techniques that i never knew of, when i was doing regular sudoku puzzles…i was just wondering if you had a page just explaining all the different types of techniques and their names that you can use? I am a samurai wizard and never spend more than a leasurely hour on anything under a 4 but the last 2 puzzles (August 18, and todays, August 25) have gotten me at a total stand still with nothing more to do than start guessing and they are ‘2’. I never guess. Is someone else writing these? No, it’s still me creating these puzzles. 🙂 I don’t think the difficulty of the two puzzles you mention is any different from other puzzles. I am curious to know whether a “5” rating means it’s harder than the lower ratings. I have also found that a 4 rating appears easier than a 2 rating. Can anyone tell me which is the hardest rating? Manny, yes, a higher number means that the puzzle is more difficult. However, the difficulty of a puzzle is a very personal thing, to some people some puzzles are easier than other, while some people would find the opposite. While attempting to solve the Samurai Sudoku (Wash. Post, Sunday 1/20/2008) I seemed to have arrived at non-unique solutions). Four of the 9×9 puzzles solve uniquely and are consistent amongst themselves. The fifth 9×9 puzzle (bottom right seems to have multiple solutions) with two non-unique rectangles for the digit pairs 54 & 89. Dear Peter, the problem is with your solution of the center puzzle. You have two 6s in the last column of the center puzzle, which, of course, is against the rules. Hey… so I was looking for something to check my one of my sub-puzzle things.. so is there anyplace I can go to check my work? After trying to solve one of these since january, I was finally able to solve the 3/30/08 edition in the wash Post. after working on it for over a week! I have a hard time understanding the written explainations on tips to solve. I am reminded of the Louis Armstrong Quote about What is jazz? “If you have to ask you’ll never know? That’s how I feel about x wing and sword fish,and naked triples. I think i need a live chat version of solving tips:) I just don’t understand the explainations.! anyway, I’m off to try my luck with the 4/7 edition!!! Claudia, X-Wing and Swordfish techniques are never needed in the puzzles that are published in The Washington Post and/or Express. Naked/hidden triplets might occasionally come about and they can be difficult to spot, but with a little practice you should be fine. The best advice I can give – practice those advanced techniques (such as naked/hidden subsets) on regular Sudoku puzzles and then move on to the Samurai puzzles. How do you determine the difficulty, example 0-5? Have you ever had a 0? Is 5 the most difficult? Has anyone solved the puzzle from Wash. Post 9/28/08. I am stuck on the top right boxes. What did you get? Dennis, you can find the solution on the http://www.djape.net/solutions/ solutions page. ok so i have to do a samurai sudoku for extra credit in school. but i dont get the directions AT ALL!!! i need help to solve it!! I am looking for the solution for the Samurai Sudoku puzzle from the Washington Post for Sunday May 10, 2009. Do you know how I can find it? The samurai sudoku published in The Washington Post of April 10, 2011 has no solution. Why bother to publish sudokus with such poor quality control? Ivan, you will have to elaborate on that comment. It has never happened that a puzzle I published had anything but a unique solution. So, if you claim that this one doesn’t, I ask you to have a look at the archive where there is a solution to this puzzle. Well, I can’t reproduce the solution I had. I no longer have the puzzle as originally published by the Washington Post and the copy I received from you, Djape, does have a solution. Either I overlooked something when I went through my solution or else the copy I received from you does not exactly replicate the published puzzle. The benefit of my doubt should go to the publishing procedure and so I withdraw the comment about poor quality control. It would make your puzzles easier to work with if you could put up a grid so that we could print if off. That would hopefully give us a bigger space in which to put our possible numbers in the squares and when our squares got to messy we could then print off a new one. Bil, thank you for your comment. 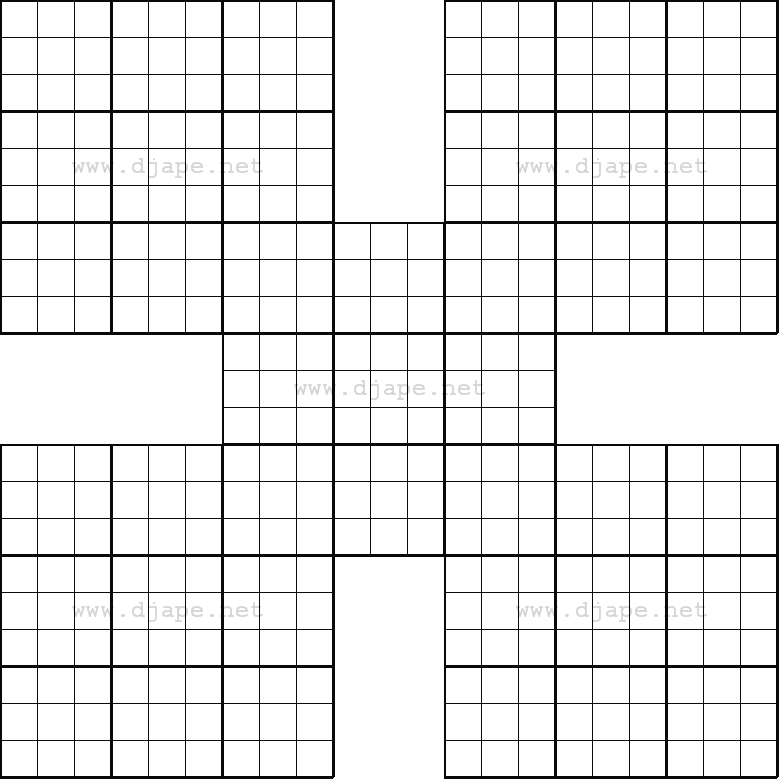 If you need a blank grid for Samurai Sudoku or Diagonal Sudoku (which is also good for Killer Sudoku), you can find all of them here: blank grids. There appears (at least to me) to be a second solution to the Sunday, 11-25 puzzle from the Washington Post. All changes are in the center three columns of the center section. Below the 5-7-1, use 9-6-8, next 4-2-3, then all the same as you had until the penultimate line of three which would be 6-3-9 and the last of 2-8-4. Ken Laun 703-978-1390 or see below. me fits. What’s going on here? OK, first Question….Why am I the only entry for 2018? Next….I enjoy Sudoku in all the local papers and rags. I was visiting an in-law in D.C. when I ran across a Samurai Sudoku in the Post (5/20/18)..1st time I’ve seen an SS, so I took it on. Hit a wall on the lower left puzzle, all the rest went fine. What am I missing? Answer this question, is this how the lower left box in the center puzzle reads?